WASHINGTON (AP) — White House senior adviser Jared Kushner has lost his access to the nation’s deepest secrets. His credibility as a negotiator may be next. Kushner’s loss of his top-secret clearance could be particularly problematic in his role overseeing the Trump administration’s efforts to produce Mideast peace. “I could not have done my job” with a security clearance at Kushner’s level, says Frank Lowenstein, who served as special envoy to the region during Barack Obama’s second term. The White House insists that Kushner’s job will be unaffected by this week’s downgrade to his security clearance. But the new limits on Donald Trump’s son-in-law’s access to information may well curtail his work — and raise questions about his longevity in the West Wing. Separately, the White House announced Wednesday that Communications Director Hope Hicks, one of the president’s most trusted aides, is resigning. The news of her leaving, the latest in a string of notable departures, came the day after she was interviewed for nine hours by the House panel investigating Russian interference in the 2016 election. And late Wednesday, The New York Times reported that two companies made loans worth more than half a billion dollars to Kushner’s family real estate firm after executives met with Kushner at the White House. Former U.S. and international officials say that even if Kushner stays at the White House, his job won’t be the same. Chris Hill, who was in charge of nuclear negotiations with North Korea during President George W. Bush’s administration, said it would be nearly impossible to be effective without a full clearance. The downgrade is only the latest clipping of Kushner’s once-sweeping foreign policy role. During the presidential transition, Kushner, 37, was the principal liaison for more than a dozen foreign governments and world leaders who sought to build relationships with Trump. Last year, he played a significant role organizing the president’s foreign trips to the Middle East and Asia, and made solo trips in his own right. But Kushner has seen his portfolio in the administration shrink steadily over the last year, amid concerns from chief of staff John Kelly and others that he was undermining Secretary of State Rex Tillerson. On foreign policy, officials said his recent focus has been the U.S.-Mexico relationship as well as the Israeli-Palestinian peace process. The impact of his clearance downgrade on his domestic assignments is expected to be minimal. He leads the Office of American Innovation, which is focused on public-private partnerships that can transform government, promote economic growth and repair the nation’s infrastructure. As news of his reduced access to classified information broke on Tuesday, he was on Capitol Hill discussing the administration’s plans for criminal justice reform. Still, Kushner is losing access to the highly secret presidential daily brief, and his ability to remain in the room for some of Trump’s most consequential domestic and foreign policy decisions. Lowell, Kushner’s attorney, said he had not been informed of any reason for the holdup in Kushner’s permanent top-secret clearance. The presidential aide has been forced to repeatedly correct omissions in his “SF-86,” the government form used to apply for clearances, as well as in his financial disclosure forms. Intelligence officials have expressed concern that his business dealings were a topic of discussion in conversations he was having with foreign officials about issues of interest to the U.S. government, a former intelligence official said. The official, who spoke only on condition of anonymity to discuss Kushner’s security clearance review, said there was a difference of opinion among intelligence officials about the significance of the conversations. Some believed Kushner knew his business dealings would likely come up in the conversations and was too naive or inexperienced to know how to steer clear of the topic in light of his position as Trump’s adviser, the official said. Others thought Kushner knew the topic would likely surface and used the opportunity while talking to the foreign officials to engage in conversations about his business interests. State Department spokeswoman Heather Nauert told Fox News on Tuesday that Kushner would remain focused on Middle East peace. “I can’t see any change on the importance of that or his work on that issue,” she said. But privately, officials say there has been no internal communication about Kushner’s status, leaving aides to learn of changes in the press and sparking speculation that more substantial changes may be afoot. 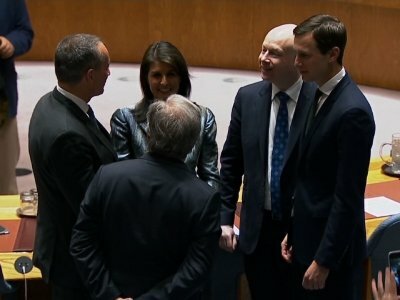 Aaron David Miller, a former Mideast peace negotiator under presidents of both parties, said losing access to top secret information wouldn’t prevent Kushner from finishing the U.S. peace plan but would hamstring him when it comes to the next step: talks involving both sides. Miller said eventually, if a deal is to be reached, highly sensitive details must be discussed regarding borders, surveillance and control of the electromagnetic spectrum. Other arms of the U.S. government such as the CIA and the Defense Department would be brought in, but Kushner wouldn’t be able to attend certain meetings without high-level clearance. Under normal circumstances, the point man for Mideast peace would have unfettered access to droves of classified information at the top secret/codeword sensitive compartmentalized information (TS/SCI) level, including possible U.S. intercepts of conversations, Miller said. Uzi Arad, a former national security adviser to Israeli Prime Minister Benjamin Netanyahu, said Kushner’s security clearance issues would likely not affect his treatment by Israel. Associated Press writers Josh Lederman and Deb Riechmann in Washington, Bernard Condon in New York and Ian Deitch in Jerusalem contributed to this report.